The new addition to the Artisan Series features four tonewoods. 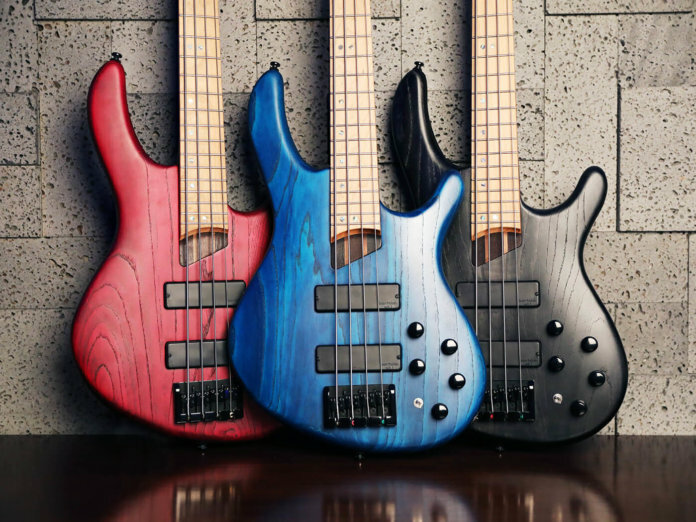 The latest product of Cort’s material innovation is its all-new B4 Plus AS RM bass. This instrument features a bevy of tonewoods – four in total – to deliver a balanced sound. The most interesting aspect of the new bass is likely its roasted maple fingerboard, which the Korean brand states has been treated at high temperatures in an oxygen-free oven. The result is two-fold: added wood stability for a bolder tone and a vintage-leaning, golden-brown appearance. The instrument also features a swamp ash body, chosen for scooped mids with a robust low-end and pristine highs. The bass’ body is complemented by a five-piece panga panga and walnut neck designed to provide a tighter midrange. When put together, this body-neck profile produces an “ideally balanced sound to round out the bass spectrum”, according to Cort. In the electronics department, the B4 Plus AS RM is loaded with two Bartolini MK-1 pickups. These are voiced for a range of tones, including punchy, warm mids as well as transparent highs. The pups can be further shaped by a Markbass MB-1 EQ boost switch and a Markbass three-band EQ. The B4 Plus AS RM comes in three open-pore finishes: Aqua Blue, Trans Black and Burgundy Red. Retails at $749.99. More info at cortguitars.com.